Jonathan Stuart Leibowitz was born on this day in New York City, New York, USA in 1962. He is 50 years old today. He grew up in Lawrenceville, New Jersey where he went to Lawrence High School. He went to William and Mary College in Williamsburg, Virginia where he majored in Chemistry before changing to Psychology. He graduated in 1984. He worked in a number of jobs after graduation from contract administrator to bartender to puppeteer. 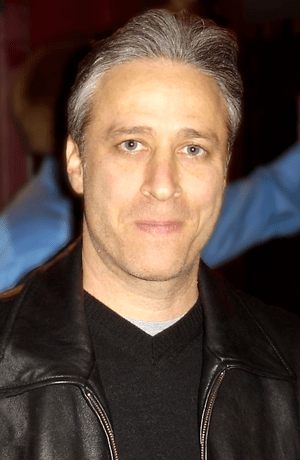 He began stand up in 1987, adapting stage name Jon Stewart. He wrote for Caroline’s Comedy Hour on TV then co-hosted the Short Attention Span Theatre on Comedy Central. MTV’s Jon Stewart Show followed. When Craig Killborn left The Daily Show Stewart took his place behind the big desk. He has won 16 Emmy Awards for his work on The Daily Show. Stewart has written 3 best selling comedy books: Naked Pictures of Famous People; America (The Book) and Earth (The Book). This entry was posted on Wednesday, November 28th, 2012 at 3:10 am	and tagged with Daily Show, Jon Stewart and posted in Entertainment, Jon Stewart, postaday, Thought of the Day, Today's Birthday, United States. You can follow any responses to this entry through the RSS 2.0 feed.